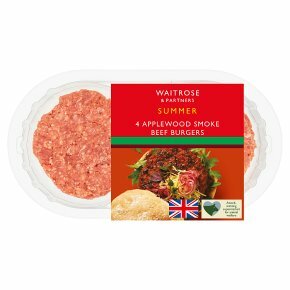 INGREDIENTS: British beef (89%), rehydrated potato, rice flour, fructose, white wine vinegar, applewood smoked water, rapeseed oil, applewood smoked paprika, sea salt, tomato purée, salt, lemon juice from concentrate, onion powder, red pepper extract, applewood smoked sea salt, applewood smoked black pepper, black pepper, preservative (sodium sulphite), cornflour, maize dextrose, antioxidant (sodium ascorbate). Grill (Medium Heat) 12 - 14 minutes ……Preheat grill. Remove all packaging. Place on grill rack under a medium heat, turning occasionally until thoroughly cooked, the juices run clear and there is no pink meat.